Porcelain plank tile flooring– Create the illusion of gorgeous wooden flooring for a fraction of the cost. Porcelain plank tile flooring is more durable, customizable than natural wood flooring. Handcrafted tile– Make your backsplashes, bath tubs and walls shine as the focal point of the bathroom with handcrafted tiles in a range of shapes, colors, patterns, and designs. Porcelain tile– Porcelain is one of the most popular choices for both bathroom floors and walls, and is available in many colors and styles. Glass tiles– Glass tiles may be found in smaller shapes and are ideal for showers, accent walls and backsplashes. Stone– Villagio Tile’s stone floor tile options are perfect for your Scottsdale home. We have everything from pebble and multi-sized stones to marble and mosaic. Decorative– Attractive ceramic tiles complete many exquisite bathrooms in homes throughout Arizona. Metal– Homeowners that are looking for an edgier or more glamorous look love our many metal selections for bathroom tile. Villagio Tile in the Phoenix area has a staff of expert designers that will help bring the vision you have for your bathroom to life! Coordinating your floor tile and wall tile will lend itself to a clean and polished look. There are so many colors, textures and patterns to choose from that the possibilities for your bathroom are endless! 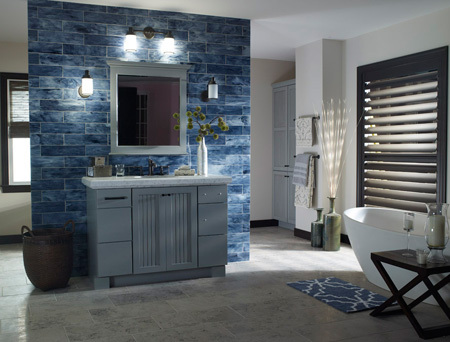 For more information about decorating or designing your bathroom with our exquisite tile selections, contact Villago Tile in the Scottsdale/Phoenix area today!